These fun soda can glasses are each adorned with a floral silhouette image on one side of the glass in a different color. There is a chartreuse, purple, turquoise and tangerine floral included in the set of 4. The 16 oz. 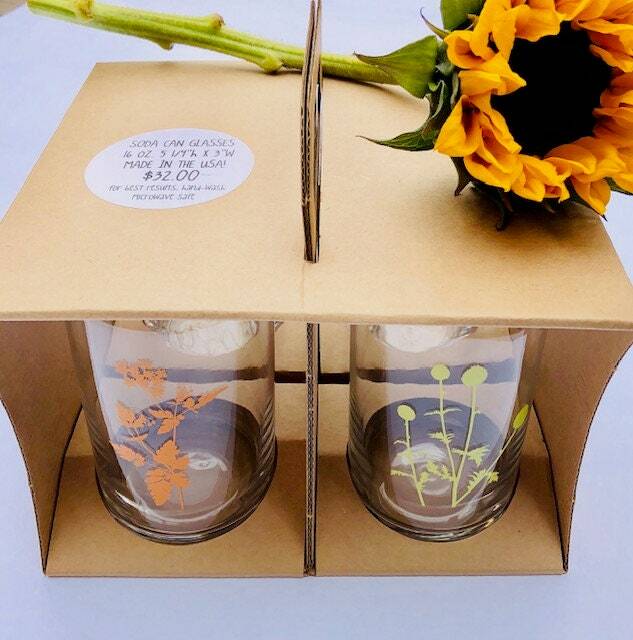 glasses come packaged together in a kraft color gift box with handle, ready to give as a gift! Glass specifications and ByCary info stickers are included on the outside of the box. The set will arrive undone, taking the glasses apart to wrap each glass individually; I will send instructions on how to fold the gift box yourself once it arrives to insure the safety of the glasses while shipping. Or, if you don't care for the gift box for any reason, just convo me! Enjoy your new, sweet set of glasses!